The Open Door Classroom: New Blog Design and Other Fun Stuff! I am sooo excited about my new blog design! I was looking for something unique for my blog and came across Sour Apple Designs's DIY. I was thrilled to be able to design my own blog! It was fun, fast, and super easy to do. The hardest part was choosing all of the colors, fonts, and designs. What do you all think?! I still need to tweak a few things, but it's close to being finished. If you're interested in designing your own blog, I highly recommend this website. Click on the image below to learn more about it! It is a little bare right now, but will look more complete as we add events throughout the year. To learn more about this item, click on the picture below! 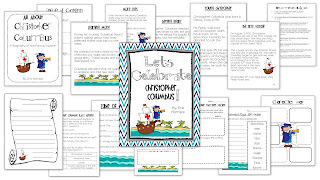 I also just completed a mini-unit on Christopher Columbus to celebrate Columbus Day on Monday, October 8th! 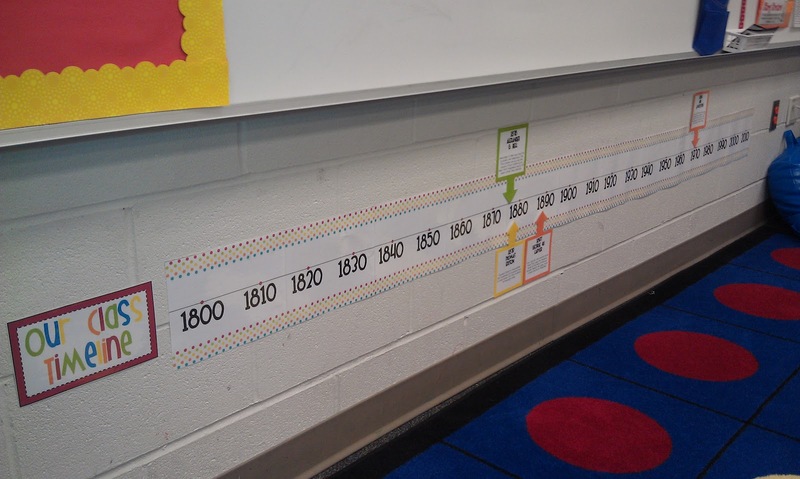 This unit is packed full of meaningful activities to use on Columbus Day. Reading, writing, phonics, and math activities are all included. In this packet, you will find: a recommended book list, an original book titled "All About Christopher Columbus: A Biography of the Famous Explorer" (This book is written in kid-friendly language that your students will be able to understand! ), an acrostic poem template, a character map of Christopher Columbus, ABC order practice, number stories that include true information about the explorer, and a R.A.F.T. writing activity (your students will pretend to be Christopher Columbus and write a letter to a family member explaining the voyage). Click on the image below to check it out! Last, but not least, this week I am planning on teaching my students how to make predictions. I think it's so important for students to make predictions while they read, but equally important is explaining the thinking behind their prediction. Using evidence from the book to support their prediction is crucial. Otherwise students make wacky predictions without really thinking about the story. 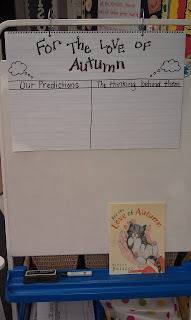 Tomorrow, I plan to read the book For the Love of Autumn by Patricia Polacco and fill out this chart with students' predictions during the story. 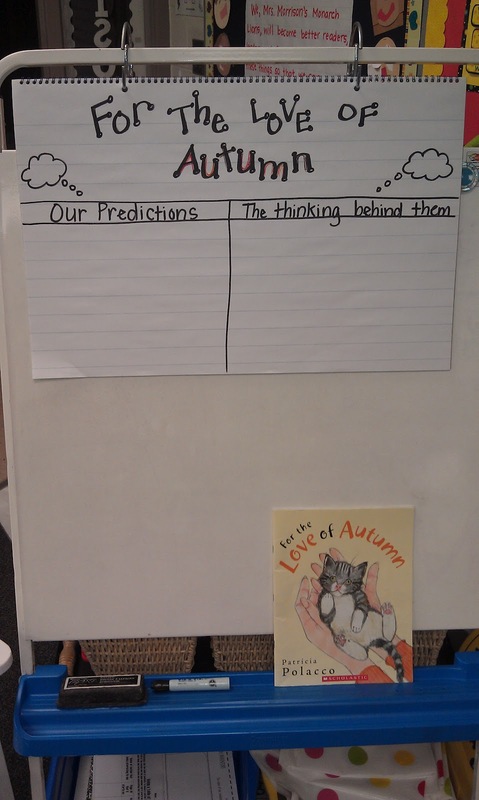 I also plan to model my own predictions and use plenty of think alouds to explain how I made my predictions. I always tell my students "Reading is THINKING!" Your new blog design looks great! I love the book, For the Love of Autumn. It's one of my favorites. Looks like apple picking was fun! How fun!! I kinda wish I didn't love our blog design so much because I think creating one would be fun. I also love the book, "For the Love of Autumn". Thanks for sharing the idea of using it for predictions! Erin - your blog is too cute...I love the bunting at the top. Also that Columbus day pack looks super cute! Fun stuff! Erin- Your new blog design is great. I love Sour Apple Studio designs too! Looks like apple picking was a success! So fun! I am encountering ргοblems ωith your RSS. I don't know the reason why I cannot subscribe to it. Is there anybody else having the same RSS problems? Anybody who knows the answer can you kindly respond? Thanks!! I say to you, I certainly get irked whilst folks think about worries that they plainly do not realize about. Such a cool post. Thanks for sharing.